The Cyprus Assay Office hallmark is a guarantee for the quality control of the precious metal article. It is applied on every article made of precious metal (gold or silver) after an accurate analysis of its alloy. The hallmark is very important for consumers, because the quality of each article is ensured with the stated purity fineness. States the minimum purity in parts per thousand of the metal in the alloy. The Manufacturer’s mark is approved and recorded in the CAO Manufacturer’s Registry. It is unique for every manufacturer and cannot be reissued for anyone else. 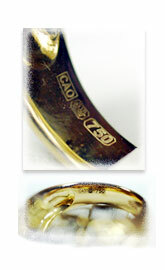 The manufacturer's mark must be struck on the articles by the manufacturer before they are submitted to the CAO for Hallmarking. The manufacturer may make arrangements for the manufacture's mark to be struck by the CAO, upon submission of the articles to be struck with the approved hallmarks. The Official mark and Fineness mark can be applied only by the Assay Office. No negative tolerance is permitted on the above standards of finenesses. Standards of finenesses and permissible purity of solder can be found in Annex III, section I and II respectively of the relative Law.